Eddy is the half brother to Tiko. Just look at that adorable face! We are so excited to see what he will produce! His picture tells it ALL! He is as sweet as he is cute! His Confirmation is as wonderful as his Daddy Toto’s. He is a very short, cobby boy! No eye white, just perfect in my book!!! Before you welcome a new Teacup or Imperial Shih Tzu puppy into your home, it’s important for you to do your homework and learn as much as you can about the puppy’s parents, as they will give you a glimpse into what you can expect from your new Shih Tzu. Fortunately, Tuscany’s Tiny Shih Tzu makes it easy for you to do this by providing you with information on the mothers and fathers we use to breed Shih Tzu puppies. 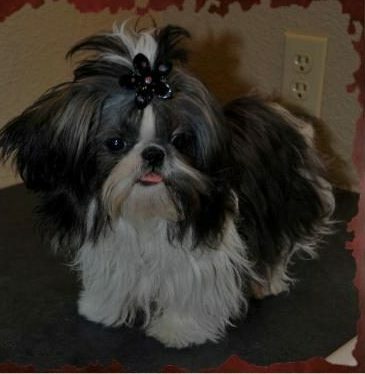 All our fathers are AKC-registered and APRI-registered Imperial and Teacup Shih Tzus from healthy lineages. An AKC-registered Shih Tzu, like Tiko, is what you’ll find when you trust Tuscany’s Tiny Shih Tzu to be your Teacup and Imperial Shih Tzu breeder. He has consistently produced beautiful Teacup and Chinese Imperial Shih Tzu puppies, and in our opinion, is simply perfect! We work hard to provide fathers like Tiko with a warm and loving environment in our home, ensuring that they never feel like anything less and family. Our adorable, Chinese Imperial and Teacup Shih Tzu fathers are not for sale. However, these fathers play an integral role at Tuscany’s Tiny Shih Tzu. If you are interested in seeing any of the Teacup or Chinese Imperial Shih Tzu puppies for sale that were fathered by Tiko, visit the Nursery pages for updates on current litters. If you come across a puppy that you are interested in making a part of your family, simply give us a call at 509-865-2097 or 509-985-0143 so we can answer any questions you may have. In our Shih Tzu puppies we breed for the highest quality of health, temperament, disposition and personalities. Payment must be received in full by the age of 7 weeks or one week prior to expected shipping for older puppies. To hold a puppy a $500 deposit is required and is non-refundable. The deposit goes toward the puppies final price or may be transferred to another puppy. We do not ship via Cargo, my puppies are all delivered via a Puppy Nanny! Puppy Nanny's fee is $500.